The rotor of a machine is held in place by the thrust bearing, but depending on where the fixed or pin point is located on the machine, the thrust bearing can also slide as the machine expands. Regardless, as the machine heats up or cools down, it is vital that the rotor and the (static) casing 'grow' at the same rate so as to avoid rotor-to-stator contact, which will invariably destroy the machine. During the transient phases of operation of a rotating machine, (start-up or cool-down) heat soaking and dwells are used to ensure that thermal expansion or contraction to not cause rotor-to-stator contact. 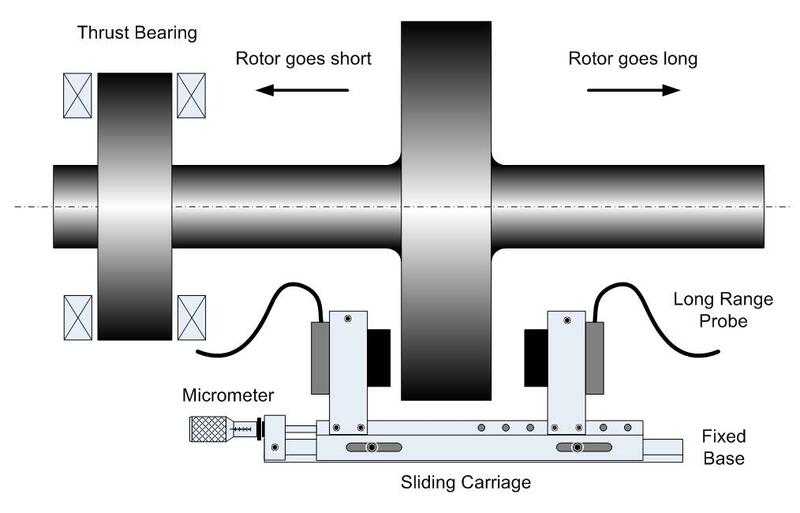 It is common to use non-contact probes (eddy current probes) attached to the turbine casing to observe the rotor, thereby measuring the difference between the movement of the rotor and the casing as they thermally expand. Eddy current probes are available with measurement ranges up to 1/2 inch or more, and so sometimes this measurement can be made conventionally, i.e. with the probe directly observing a rotating flange or collar. However, in some instances, the range required is greater than the probe range available – due to physical or target area limitations, and therefore an alternative method must be implemented to measure the differential expansion.